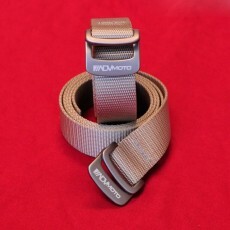 The ADVMoto Light belt features a durable Sand colored nylon web with a brushed gun-metal buckle featuring the ADVMoto logo. Good for both men and women who don't want a money stash pocket, this comfortable rugged belt will keep your pants right where you want them ride after ride! Belt width is approx. 1.1" (30mm). Length measures 48" from belt tip to buckle attachment and can be trimmed with a hot-knife.